On the bridge is L to R: Taylor Bragg, Abbie Hibdon, Zettie Elrod and Julie Bush. 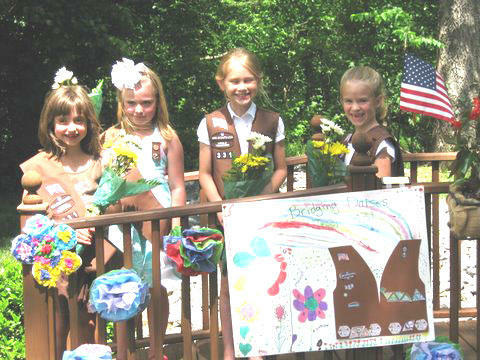 On Saturday, May 22, Girl Scout Troop 331 bridged from Daisy Girl Scouts to Brownie Girl Scouts. The ceremony was held using the bridge in the beautiful garden of Mr. Richie and Glenda Hunter in Woodbury. The program was led by Troop Leaders Jamie Hibdon and Tami Bragg. Completing the bridge were first grade students, Abbie Hibdon, Taylor Bragg, Zettie Elrod and Julie Bush. The ceremony included reciting the Pledge to the American Flag, the Girl Scout Promise, the Girl Scout Laws and the presentation of their new brownie sash or vest. Each girl was also given a bouquet of daisies. The bridge was decorated with tissue paper flowers and a poster the girls had made for the occasion. The all appreciated their teacher Lisa Vickers for attending and bringing her brownie uniform from when she was in Girl Scouts to share. She presented them with a special gift as well, a gift bag with a box of brownie mix, a daisy vase, and a journal to record their memories.